With the mantra “Retro never sounded so now!,” the dreamy voices of the four lead singers of pop quartet Under The Streetlamp are poised to bring the repertoire of “The American Radio Songbook” to a whole new audience while simultaneously reminding the original fans why they fell in love with the music in the first place. The former cast members of Broadway’s “Jersey Boys” take the State Theatre stage on Wednesday, June 25th. Show time is 7:30 PM. Tickets are $45 & $35 and can be purchased by visiting the State Theatre Box Office, 453 Northampton Street, Easton, by calling 1-800-999-STATE, 610.252.3132 or online at www.statetheatre.org. Sponsored by Team Capital Bank and IronPigs Baseball. Singing the classic hits from the 50’s, 60’s and 70’s, Under the Streetlamp brings a unique blend of tight harmonies and slick dance moves to your favorite Doo Wop, Motown and old time Rock ‘n Roll hits. However, while their musical roots remain firmly in doo-wop and “The American Radio Songbook,” Under the Streetlamp has expanded its set list to include some hit artists from the 1980s–including Billy Joel, Bob Seger and Huey Lewis, and they are working in some original material as well. 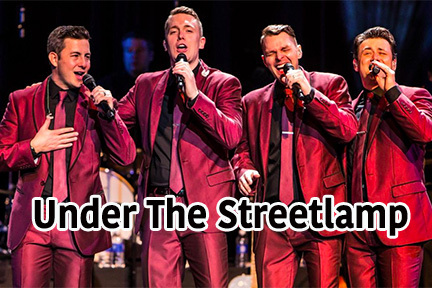 The quartet will sing great hits from groups like Dion and The Belmonts (“I Wonder Why”), The Chords (“Sh-Boom”) and The Drifters (“Save The Last Dance For Me”), all of whose songs are represented on Under The Streetlamp: Live! So are the likes of The Beach Boys (“I Get Around”), The Temptations (“Get Ready”), The Beatles (“Twist And Shout”), The Turtles (“Happy Together”), and, notably, The Four Seasons (“Workin’ My Way Back To You”). It was a stint in Jersey Boys-the award-winning Broadway musical bio based on The Four Seasons-that brought Under the Streetlamp together. Michael Ingersoll became interested in music through his grandfather Roy Francis, a jazz pianist who toured with the likes of Dave Brubeck. Other major musical influences include Roy Orbison, and his rousing rendition of “Pretty Woman” can also be heard on Under The Streetlamp Live! Shonn Wiley started singing and dancing as a child. He performed on Broadway prior to Jersey Boys, and is the group’s choreographer. Christopher Kale Jones is from Hawaii, where he grew up listing to oldies radio and singing in award-winning choirs. Like Wiley, he joined Jersey Boys with prior acting experience in New York theater. Michael Cunio rounds out the quartet as well as his duties as front man for the alternative rock band Reckless Place. Formed in Chicago in 2010, Under the Streetlamp quickly earned a local devoted following-and a reputation for generation-bridging concerts that has paved the way to a much-anticipated debut CD/DVD. Titled Under The Streetlamp: Live!, the concert recording is also the centerpiece of PBS pledge drives in major markets throughout the country. Under the Streetlamp breathes fresh new life into the music and proves that great music is timeless!